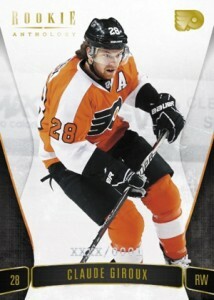 For most modern hockey card sets, rookie cards rule. They're almost always a key selling point. Recognizing this, 2011-12 Panini Rookie Anthology adds an update layer to a handful of their 2011-12 products while offering a standalone set as well. Every box of 2011-12 Panini Rookie Anthology Hockey comes with a Rookie Treasures card that comes with both an autograph and two memorabilia pieces. They are also numbered to either 499, 199 or 99. Patch versions are a possible case hit and are numbered to 15. Ten-pack boxes also promise one additional autograph and two memorabilia cards. 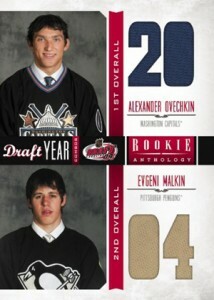 2011-12 Panini Rookie Anthology Hockey updates some of their more popular rookie programs. The checklists have been expanded to include players who weren't available when the original sets were released or they were left off the checklist to avoid further redemptions. One of the highlights is bound to be Rookie Silhouettes, which were originally available in 2011-12 Panini Crown Royale Hockey. Each comes with a memorabilia piece that acts as a backdrop to the player photo. Rookie Silhouettes are also numbered and autographed. Limited Phenoms return as well. The original lineup was in 2011-12 Panini Limited Hockey. These cards have a large fabric area signed by the player and a small manufactured patch. Two or three Limited Phenoms are in each case. Draft Year memorabilia cards pair up players from the same draft class with multiple swatches. Luxury Suite rookies fall one per case and are numbered to 99. Cases should also have one Autographed Ice Breakers card and either a Rookie Silhouette numbered to 99 or 25, and a Rookie Treasures Patch. This product deserves four stars. It has a little bit of everything. In the checklist the “rookie treasure” autos are in three groups. I opened four boxes and got about five rookie treasures from tier 3, one from tier 2 and one from tier 1-Brendan Smith of Detroit. I really like the dual stick and Jersey Combos. I got a Jagr one that I really was hoping I would get. I also got a Joe Thornton one. 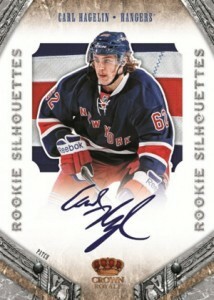 I like how the product anthologies rookies as well as it anthologies the past 2011-12 hockey year of Panini products. These are really sweet cards.